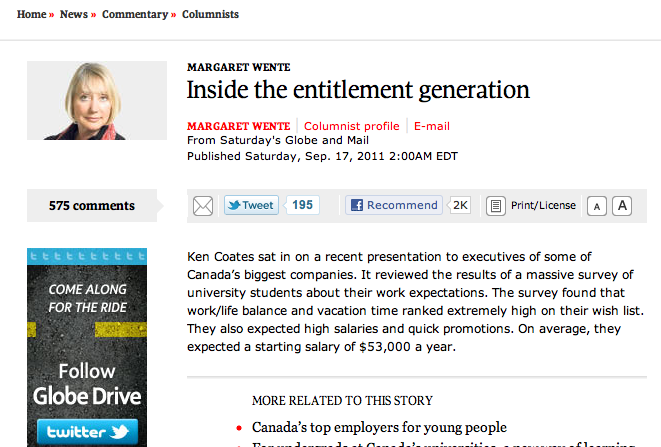 Screen shot of Wente's article at www.theglobeandmail.com. I believe I can speak on behalf of all students my age when I say there are few things more irritating than when baby-boomers conveniently slap the “lazy” sticker on our foreheads, ascribing false attributes to our age group, and lamenting the so-called “loss” of blue-collar values. In her Sept. 17 Globe and Mail column, “Inside the entitlement generation,” Margaret Wente not only makes broad generalizations about modern-day students, but calls into question contemporary students’ desire to educate themselves. Wente has coined us the “entitlement generation,” a group of “kids who’ve always been told they’re smart,” and “never pushed too hard.” In the most banal sense, we might as well be called the freeloading generation; in her view, we’re simply slackers that lack any reason for having a voice. Wente claims that students are now choosing unchallenging courses, striving to succeed while exerting the least amount of effort possible. For Wente, we are no longer “cluttering [our] minds with ideas,” and are largely “not interested” in the challenges that face us, such as the volatile global economy. She argues that we lack the required skills and attitudes that will allow us to take the reigns of society upon graduation. I would like to challenge Wente’s position, proposing that instead of creating aggrandizing claims regarding student apathy, she should walk around a Canadian campus and speak to what she calls the “entitlement generation”. Take Dalhousie University and King’s College, for instance. We have the Dalhousie-Kings Oxfam society, a group “committed to pursuing the more equitable distribution of wealth and power,” as stated on the Tiger Society website. There is the Dalhousie Model United Nations, which encourages student activism and educational outreach, and the Dalhousie Black Law Students’ Association, a group dedicated to “promoting and assisting African-Canadian students in the pursuit of a legal education.” These organizations, and countless other Dalhousie societies that promote similar advocacy, are indicative of students’ desire for the advancement and preservation of their educational development. Students at Dal and King’s are passionate about their studies and keen to utilize these services and groups. We may be quick to speak out as a generation, more inclined to “protest [our] marks” and voice our opinions about professors’ expectations, but isn’t this sense of entitlement an indication of our determination to be acknowledged? Wente fails to comprehend that when people of her generation write about students, they are encouraging us to slide behind a socially constructed veil of lowered expectations. Why speak up when generalizations continue to hold more weight and our actions only ever garner a tepid response? By assuming that students have abandoned their social responsibilities and are only peripherally experiencing the world, they are motivating us to undertake only passenger-seat responsibilities. Entitled, we may be. But unable to take the driver’s seat and make a difference? Now, that’s something to speak up about.